A. Katre, J. Carrete, T. Wang, G. Madsen, N. Mingo. Phonon scattering rates (τ−1) from different charged defects in GaN plotted with respect to phonon frequencies (ω). 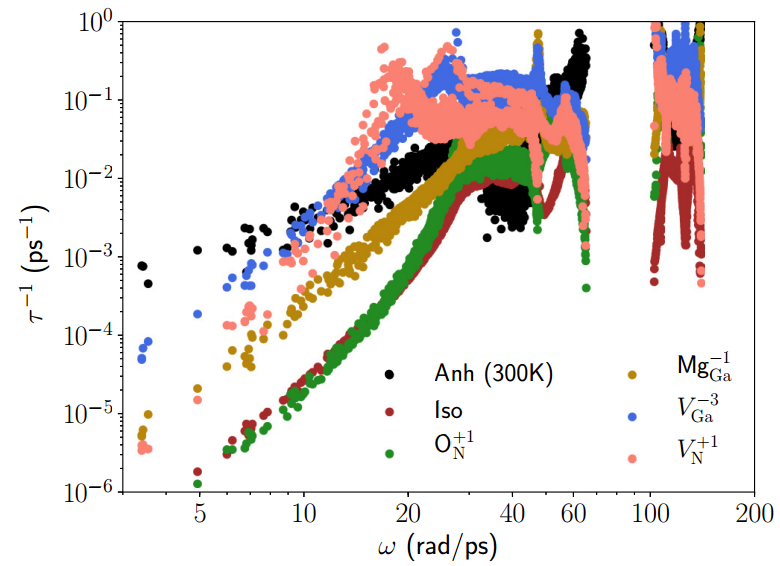 The defect concentration of 1020 cm−3 is considered here and the corresponding scattering rates are compared to anharmonic scattering at 300 K and isotope scattering. The corresponding defective GaN structures are also included in the SM. Determining the types and concentrations of vacancies present in intentionally doped GaN is a notoriously difficult and long-debated problem. Here, we use an unconventional approach, based on thermal transport modeling, to determine the prevalence of vacancies in previous measurements. This allows us to provide conclusive evidence of the recent hypothesis that gallium vacancies in ammonothermally grown samples can be complexed with hydrogen. Our calculations for O-doped and Mg-O codoped samples yield a consistent picture interlinking dopant and vacancy concentration, carrier density, and thermal conductivity, in excellent agreement with experimental measurements. These results also highlight the predictive power of ab initio phonon transport modeling, and its value for understanding and quantifying defects in semiconductors.